If you think you might have won the lottery, don't tell anyone until you have spoken to Camelot. If you have no reason to think that you have won the lottery other than that the jackpot ticket was sold in your town and you have a tatty bit of paper that's been through the wash, don't say anything until you have spoken to Camelot. Do not ask a national newspaper reporter to accompany you to the newsagent. He will not have £33m in his till to give you. He will tell you what is blindingly obvious: talk to Camelot. How did Susanne Hinte ever get herself into such a pickle? Why did she go to the Times? And why did the Times go on that wild goose chase to Ambleside News instead of telling her to talk to Camelot? Well of course she wasn't the winner, but Hinte provided the tabs with a few days of fun and even the heavies with some punning headlines. Over that time we learnt that Hinte was a 48-year-old qualified nurse who, had been married twice and had two children and four grandchildren. She was born in Germany. The latter two facts weighed most heavily with reporters pondering how to describe her: she was almost universally a "gran". Now, I don't know about you, but to me the word "gran" conjures up an image of a woman in later years, possibly with greying hair, rather than someone in her forties actively engaged in dating sites. Why not call her a nurse? Or just a woman? Yes,"gran" is more informative than "woman", but it can also be misleading. 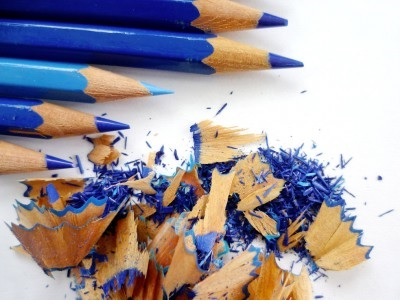 Was it used to give the impression of someone who should have known better? But that's just a niggle. The whole episode was cruel. There can't have been a single person in the country - including Ms Hinte - who believed she had a legitimate claim to the jackpot, yet only Camelot demonstrated any common sense towards her. They've seen it all before. The papers weren't going to let her off the hook that easily (it's public interest isn't it? We want to know where the lottery money goes); they could barely keep a straight face as they veered from credulity to scepticism to disdain, often within the same article. The Daily Star, whose owner runs the Health Lottery where punters have a 2 million-to-one chance of winning the £100,000 top prize, never misses an opportunity to dis the National Lottery, with its 45 million-to-one odds of winning tens or even hundreds of millions. 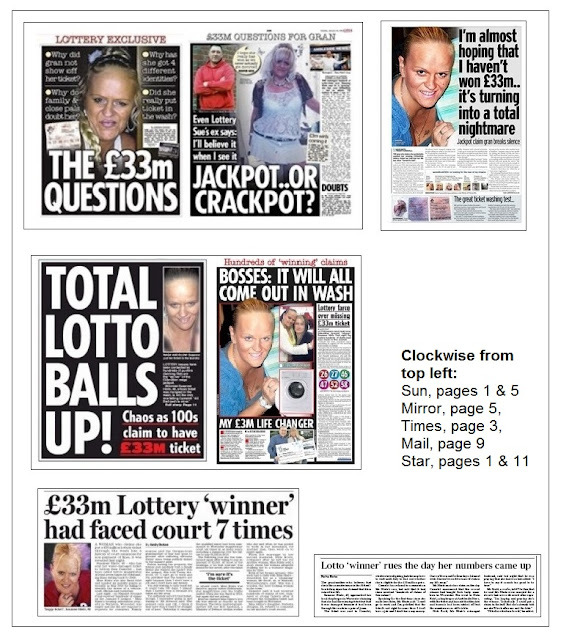 First of all, it was a farce that the jackpot had gone unwon for so many weeks. Then it was a balls-up when hundreds of people claimed a share. 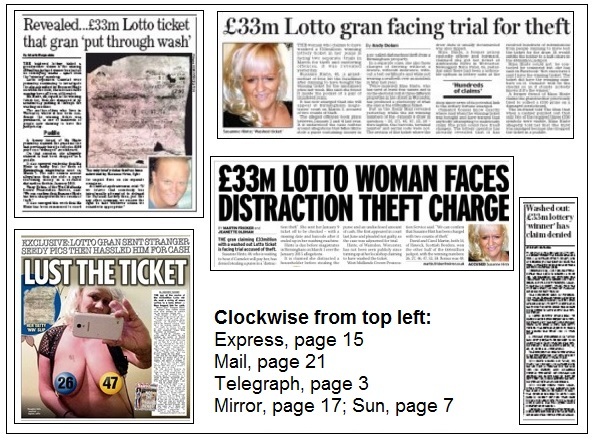 Then the statute book became splash material - the crime of trying to gain pecuniary advantage by deception carries a maximum sentence of ten years, not that anyone seriously thought any Lotto hopeful, however devious, would face such a stretch. The Times, which had set the hare running, was bowled over and left puffed out on the ground as the tabloids raced ahead in pursuit of its quarry. The Telegraph sort of joined in the hunt, while the Guardian and Indy nonchalantly turned up for the kill. There's no doubt that Hinte brought all this upon herself. But it left a nasty taste. 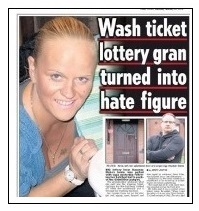 So did The Sun, which had been the most cynical about the claim, feel a qualm once the game was up? It suddenly went soft, publishing a largely sympathetic interview, accompanied by a more flattering photograph. Of course it didn't. 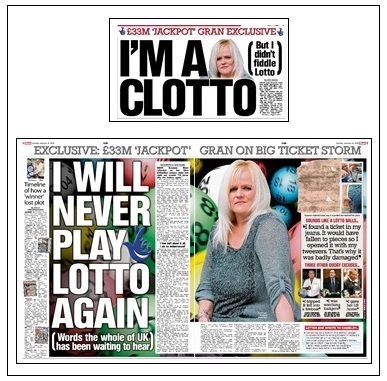 It was a clear case of mutual self-interest: an exclusive for the Sunday paper, a chance to put across a different image for Hinte - and, presumably, a windfall of not-quite-lottery-winning proportions. 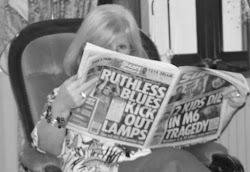 As to whether she deserved her tabloid mauling, we'll have to wait and see. If she's got any sense, Hinte will disappear back into obscurity, reappearing only as a question in the end-of-year quizzes. But if she turns up on some reality show or on the club circuit - as the Star's tame impresario suggested she could - we'll have our answer. After a busy weekend, the tabloids unmask Hinte and she is not happy. Scepticism sets in. The Sun starts asking questions and collars friends and family, the Mail has a dig into the past, the Star has a dig at Camelot and the Mirror conducts a simple experiment. The Times just about keeps the faith. 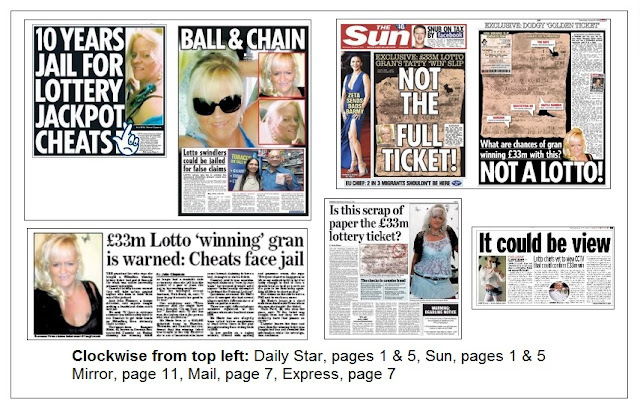 The Star and Express start issuing threats, the Sun examines the ticket, but the Mail isn't quite sure it has its hands on the evidence. The Mirror thinks the newsagent's CCTV might be helpful. The Express comes late to the party to "reveal" the "winning" ticket, the Mail and Mirror scour the court lists and the Sun uncovers the most unflattering picture yet. The Telegraph rejoins the game and beats everyone else with the real news story. The real winner or winners come forward - and sensibly remain anonymous, spoiling the fun, but opening the way to a new set of puns. Everyone, including the Independent and i, piles into the story. 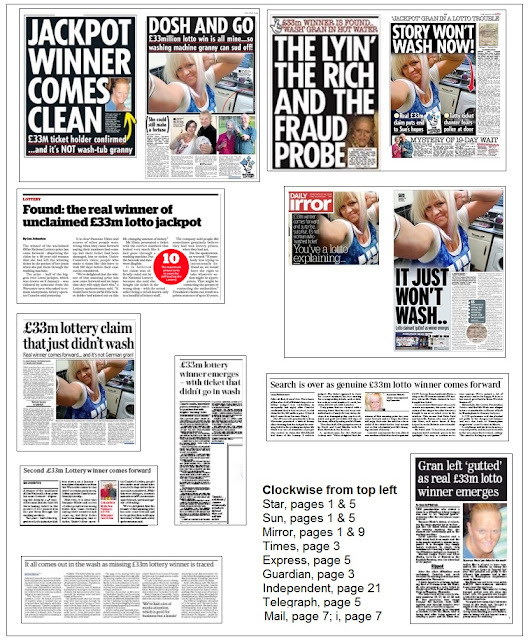 The Star predicts that even though she hasn't scooped the £33m jackpot, Hinte could still become a millionaire. The Sun comes over all CS Lewis in its splash head. The Star is reluctant to let go and leads page 9 with Hinte's estranged husband's opinion. The Sun on Sunday ends the month with a more appealing portrait of Hinte, contrite, smartly dressed and with her hair done. She has her say, the paper has its exclusive. But it still doesn't believe her. 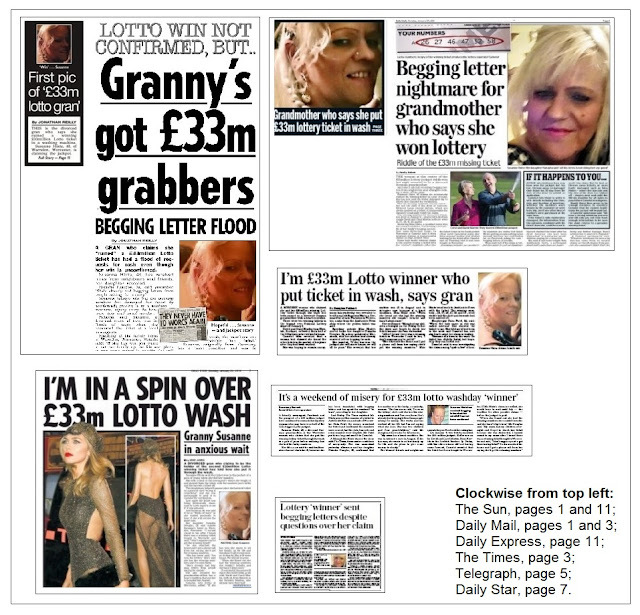 I have come this story looking for a place to play lotto online ( thelotter review) and wasted some time reading it. And worked with me just as you say "Poor granny. A granny could possibly do that and waste it". There was no photo of her provided but, man, that gutter press stuff finished me off. Thanks for the exposure.